Not only do Beni Johnson, Paul Keith Davis, David Herzog, and Pastor Ron Williams recommend this book, but so do all of us here at the Healing Rooms. We not only recommend it, but want you to buy it and read it! 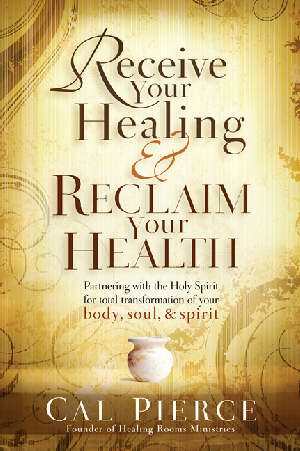 This book is a must read for the body of Christ! Do you realize that a large majority of the body of Christ is just one potluck away from a major heart attack or stroke? Cal encourages us to partner with the Holy Spirit in this book to keep us healthy and strong; he reminds us that the Holy Spirit is the best personal trainer we have spiritually, and physically. His wife, Michelle, just interjected that chapter 8 is also chock-full of wisdom and helpful hints...she should know, she wrote it! In Receiveing Your Healing & Reclaim your Health, Cal Pierce gives you the keys to experiencing the divine health you were designed for. When you give the Holy Spirit control of your health, He becomes a partner, guiding you in truth regarding nutrition, exercise and every aspect of a healthy life.